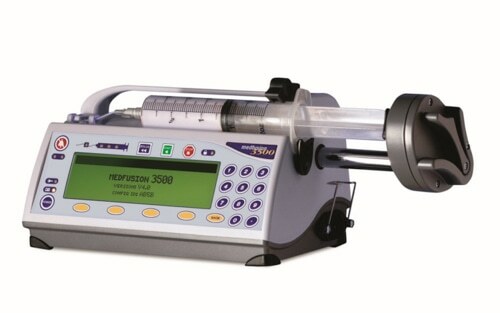 Medfusion® 3500 syringe infusion pump is chosen by the top pediatric and general hospitals for arterial, epidural, enteral, intravenous, spinal and subcutaneous medication delivery. The syringe pump was designed for the administration of fluids requiring precisely controlled infusion rates. It is widely recognized for its accurate medication delivery to patients in critical care units, including neonatal and pediatric intensive care. Medfusion® syringe pumps automatically detect syringe sizes from 1 mL to 60 mL including intravenous and enteral syringe types from the most common manufacturers. The Flow Sentry ™ occlusion detection offers adjustable sensitivity and alerts the clinician quickly in the event of an occlusion. As defined by the Institute of Safe Medical Practices (ISMP) and other safety agencies, Medfusion® syringe pumps, when used with the PharmGuard® Medication Safety Software, is a truly “smart” pump system.